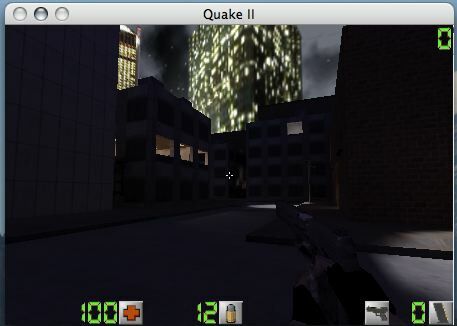 Fruitz of Dojo have created a very elegant Quake 2 Mac OS X port. You'll need it to actually run Quake 2. This download includes a Quake 2 application bundle and PowerPC-compiled plugins that will enable third-party mods on Mac OS X.
Download Action Quake 2 here. If the link is broken, visit the official AQ2 site and navigate to the appropriate download. 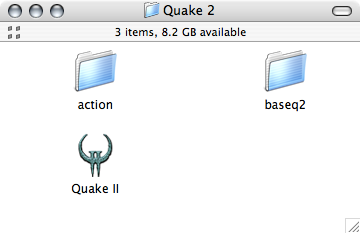 Ideally, you'll want to get a copy of a working Quake 2 installation, since you'll need the baseq2 folder and pak files. You can download the Windows demo if you don't have access to such a CD (.exe installer, extract using StuffIt Expander). Create a folder for Quake 2. 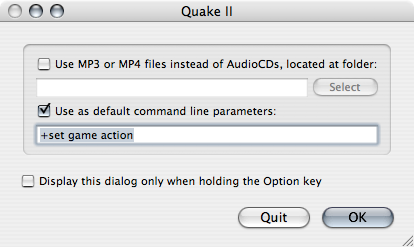 Copy the Quake 2 application bundle into the folder. Copy the 'baseq2' folder from your Quake 2 CD (or demo) into the folder. Copy the 'action' folder from your AQ2 download into the folder. Copy the respective GamePPC.q2plugin files from the port into their respective folders.